We already know that the Apex Legends community is a bastion of camaraderie and wholesomeness, thanks to developer Respawn Entertainment's efforts to encourage teamwork and fair play through the battle royale game's squad focus and innovative ping system. Today, though, the Apex playerbase has gone the extra mile in proving itself as one of online gaming's best, unanimously rallying around the relief effort in Mozambique after the country was recently hit by the devastating Cyclone Idai. For some context, Mozambique is also the name of Apex Legend's most infamous weapon, a love-to-hate shotgun pistol that is the source of many an in-joke among both players and within Respawn itself, which has thus given the community an impetus to help the nation whose name inspired it. 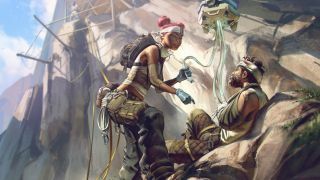 This began after a concerned player posted about the news on the Apex: Legends subreddit, and donations have since rolled in for charities currently aiding those affected by the natural disaster. Some have gone even further, and called on Respawn to donate a certain amount of money for every Mozambique kill players achieve in-game, or to even create a cosmetic skin for the gun bearing the colours of Mozambique's national flag, the proceeds of which could then go to the cyclone's relief effort. Developers have certainly achieved similar philanthropic success in previous years, such as when Blizzard set a new record for breast cancer research donations with the limited release of its Pink Mercy skin in Overwatch in 2018, so the Titanfall 2 developer certainly has an opportunity to capitalise on the goodwill of its playerbase. That said, Respawn has yet to offer any official comment or feedback to this ongoing discussion, but the studio must be proud to see its community rallying together for such a noble cause nonetheless. If you want to donate to the situation in Mozambique, this Apex Legends player has provided a list of charities that could use all the support they can get right now, so feel free to follow the relevant information from there. Apex Legends is one of the best free PS4 games to play right now, so why not use the money you would have spent on purchasing it to show some love to Mozambique right now?